When you feel the weight of the world on your shoulders, and that mountain just ahead seems almost insurmountable, it often helps to turn to a buddy. Especially one that can carry, say, heavy cases of ammunition, anti-tank missiles and gun tubes. For two weeks, students get up close and personal with the center’s platoon of mules, learning how to handle, pack and care for the animals and maneuver through the high-altitude meadows and steep terrain around Pickel Meadows, as the mountain warfare center is known. 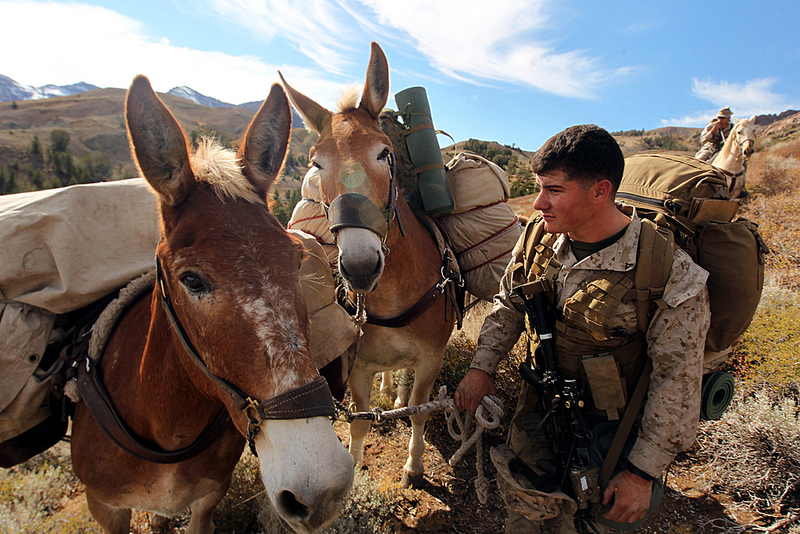 “If you’re going to fight a compartmentalized conventional war in the mountains,” Head said in this Marine Corps News story, “you’ve got to utilize animals. If you don’t, you’re not going to be able to get your logistics, your ammo,” those basic “beans, bullets and bandages” that Marines need. But will technology soon render the pack mule to the retirement ranch? Already, supplies, equipment and other cargo are getting dropped into the combat zone and remote places, and it won’t be long before remote drones and smarter, GPS-guided parachutes provide more resupply options. And that could render mules obsolete. Not sure? Check out the Legged Squad Support System, or LS3, better known as RoboMule or AlphaDog. It can carry 400 pounds, and DARPA, the Defense Advanced Research Projects Agency, and the Marine Corps Warfighting Laboratory continue testing the system. Cool, and almost a little creepy. But at least Marine won’t have to push or chase after a stubborn mule. But those robots won’t ever be as warm and endearing as Annie and Gray and other pack mules in Bridgeport’s stables.